At the link you will find free woodworking plans to build this kitchen island complete with drawers, shelves and space between for wine bottles. Build your own set of base cabinets for much needed storage in any room. Here are the free downloadable instructions to do just that. 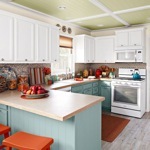 Here is how to install crown molding on your kitchen cabinets. It can definitely be a diy project. Although frame-and-panel doors appear complicated, they are not really hard to build if you take your time and measure carefully. Frame-and-panel doors consist of the rails (the top and bottom pieces), the stiles (the side pieces), and the panel. Although flat panel doors can look intimidating to a beginner woodworker, this article demonstrates how easily they can be built with a table saw. Note: These are cutting diagrams only for this kitchen island, courtesy of Workbench magazine.